You might wonder why the title of this article has the title of Rice Cooker? It's actually slang for motorbike helmet in Viet Nam. 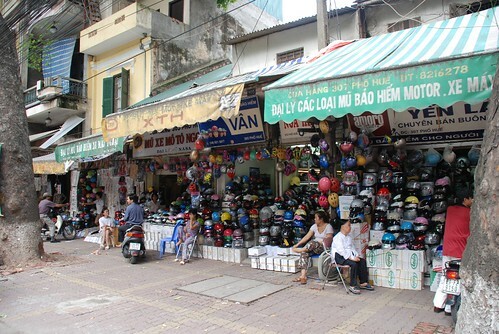 From December people all over Vietnam have to wear helmets. It sounds weird that the government has to force people to take care of their own safety. 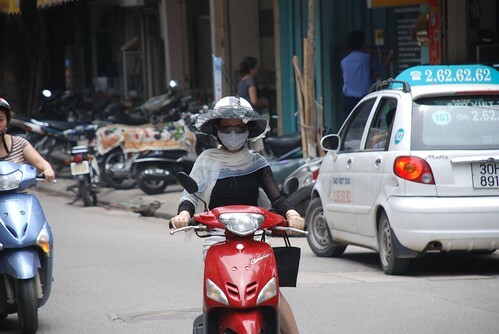 In Vietnam a few years ago, we had a rule for wearing helmets but only for those driving motorbikes on the highways but still not many people followed it, including me. I don't really feel comfortable wearing a helmut but I bought one today. For western people, wearing a helmet is something that they more than happy to do to protect their lives but for Asian people, especially Vietnamese, it isn't a habit even though they know it's good for them. I felt like I had to buy one because I have seen quite a few accidents recently between my home and the old quarter. I think it's worth spending 165,000Vnd just in case I do fall off and hit my head. Since the policy was announced, the helmet business has been doing extremely well. I went to the Honda shop and they said they sold out a few days ago, then I went to the Protec shop, which was crowded with customers selecting a helmut to suit them. Luckily I got one for myself at a good price. I also tried to buy 2 more for my friends but the staff told me that I have to go back in a few days when the next stock arrived. The most popular brand for helmets are Amoro, Honda, Lucky Star, Protect. 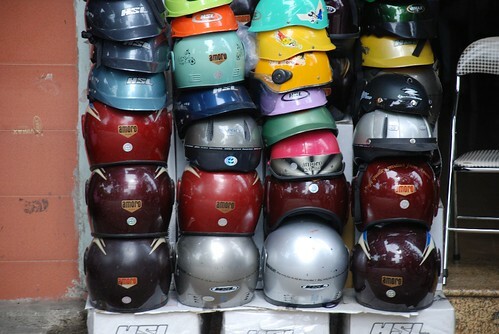 You can buy copies of these helmets which are made in China cheaply from 30,000Vnd instead of buying an original from 165,000Vnd. Most stuff from China is really cheap but I'm not sure about the quality. During my work with the crew filming about food in Viet Nam I had the chance to meet some interesting people in the fishing villages and talk to them. Yes, they are very friendly and very sweet. I met the mayor of Cua Van fishing village and we filmed him fishing in the bay. I also met his and his relatives and talked to them about why they're living here and what's the main reason to keep them here in the middle of nowhere for generations. 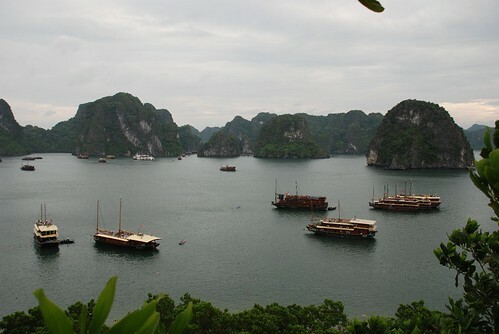 They told me they just love being here in Ha Long Bay, they love the ocean and they love fishing. Fishing also is the only skill that they have to bring in income and daily food. 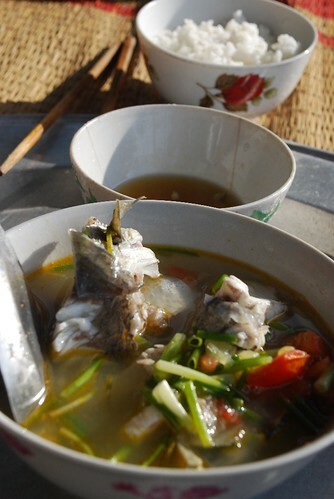 The fishermen cook their fish broth in a different way with lots of herbs, a bit of stir fried and lots of water. 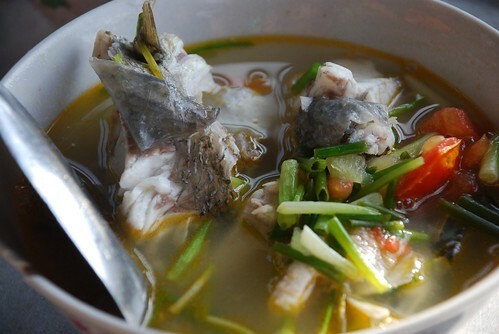 My mother and my sister cook fish broth alot and I just love their cooking , especially their broth which is a bit sweet from the fish, a bit sour from the herbs and a little bit salty from the fish sauce. It's a really great combination, a simple dish eaten with rice dipping the fish in fish sauce with some chilli, garlic and maybe some MSG. It's quite easy to do at home. Kids in Ha Long Bay are so beautiful, they look really healthy with dark skin and a ready smile. 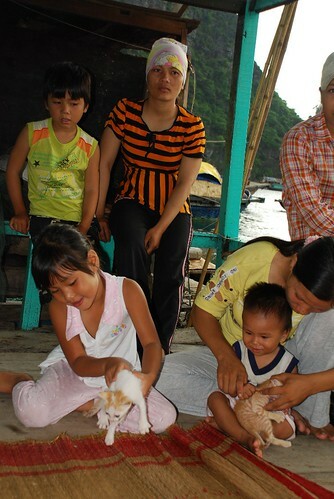 Lots of kids in Ha Long Bay actually do business during the day and I wonder when they go to school. They paddle small floating baskets toward the big tourist boats trying to sell some snail shells, food and drink and also use their small baskets to take tourists around into the villages and visiting caves. I talked to a few kids in my most recent trip back there and the number of kids who go to school is only a small percentage. Their living standards are so low that they have to help their parents earn money. Don't be surprised if you see lots of very young kids controlling their basket-boats very well or swimming very fast because they've really got used to it. This is what they do almost everyday and it's also a part of their life. Some kids are really agressive if you don't buy from them and they will keep asking you to buy from them. It's a bit like Hoi An and Sapa when you take photos of then they expect you to buy something from them or give them some money. I usually take photos, talk to them a bit then give them some small money or get in their baskets for a ride around the bay. Anyway, personaly I think kids should be at home, and going to school, not hanging around trying to earn money while they are still so young. They are the future of the country and I wonder if they see their own future floating around in a basket. I went back to Halong Bay for one night and two days as I was invited to be involved in some filming for an American TV show called Diary of a Foodie. I had such a great time working and relaxing, meeting new people, and enjoying the great bay view. 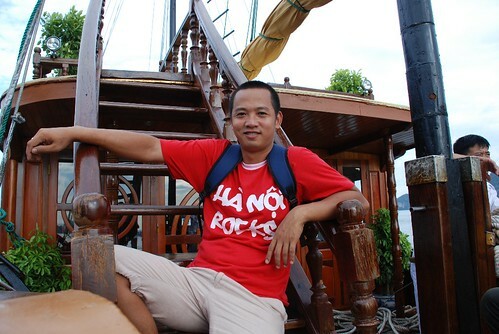 We arrived in Ha Long City at about 11 am after picking up the crew at Noi Bai airport. Rob and Tom, the producers and cameramen for the show, seemed very happy to be here in the north after almost a week in the south filming about Vietnamese food. I spent lots of time taking hundreds of photos of people, boats and scenery. I just love this gorgous place plus the great seafood that the tour company supplied on the boat. 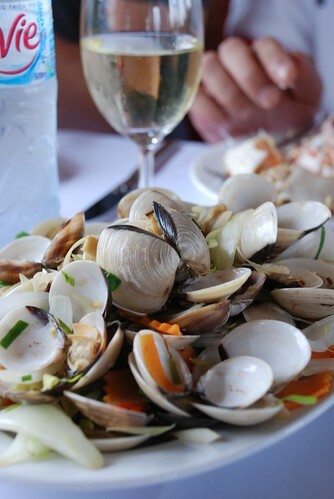 We had huge fish, big prawns, lots of big crabs, yummy scollops, fresh and tasty squid and of course some over-priced Chilean and Australian wines. Sorry but I love white wine and I can drink lots of it especially when I am on holiday :). Laying on the roof of the boat with a glass of chilled wine, talking to friends about life, about the beauty of Ha Long Bay is a great way to release stress, don't you think? You can't expect anything more than that. I dropped into BALE Well restaurant following a recommendation from a friend and I ended up really satisfied with a full stomach and a head full of information after a great chat with the very friendly owner, Mai. BALE Well gets its name from an ancient well famous in the Hoi An area. Many of Hoi An’s people use the water from this well because apparently there is no aluminium in it. While Mai’s restaurant is not as old as this well left over from the Cham period, it has been operating for over 14 years, first in a tiny shed, and now in a modern two storey house. She started the business herself with four popular dishes that belong to the Hoi An region served with a very special dipping sauce made from soya beans and lots of different herbs and vegetables. She decided to maintain the simple setting she had at the beginning, of low plastic tables and chairs. During our chat, Mai told me that the reason she hasn’t changed the décor and style of her restaurant is because her customers (mostly locals) prefer it like it is. Also, it allows her to keep the price below many of the other restaurants in town, something her customers also appreciate, I’m sure. On both my visits, Bale Well was full with a mixture of a few knowledgeable westerners and local customers. 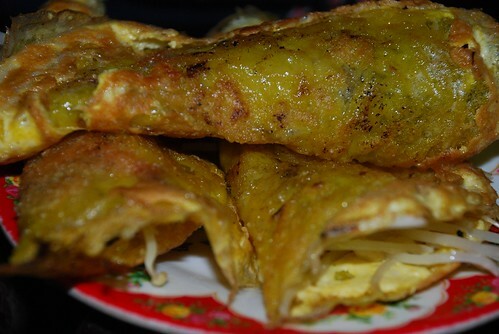 I realized that part of the attraction is the simple menu of four dishes: Banh Xeo(Rice pan cake), Thit nuong(grilled pork), Ram cuon(spring rolls), Nem nuong(grilled pork with sate). 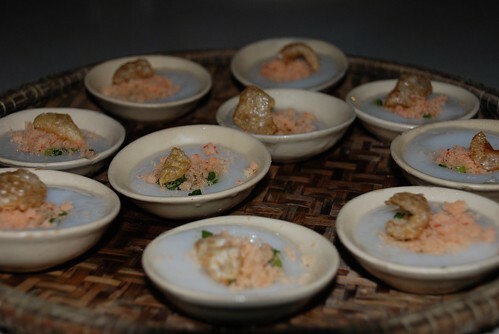 The other attraction is that prices are under 10,000Vnd per dish. It’s also possible to choose a set menu for only 50,000Vnd which is more than enough for one person and includes a bit of everything. My mate and I couldn’t finish it and we tried hard! At the end of our meal, Mai showed me many messages from regular and former customers. That’s a good sign for her and shows that she runs the restaurant really well. 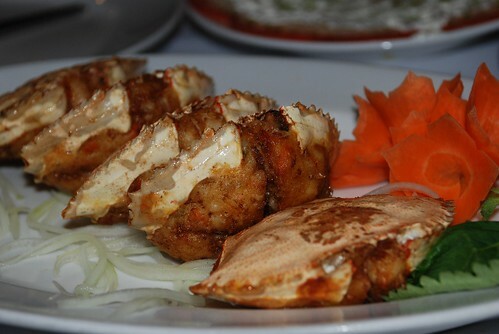 Her staff is very friendly and helpful; the food is cheap and easy to order as well. In fact, you can let Mai do the ordering for you! Set menu includes all 4 dishes: 50,000Vnd Thit Nuong - One stick grilled meat : 3000vnd Banh Xeo - Rice Pan Cake : 3000Vnd Ram Nuong - Spring rolls : 2000Vnd Nem nuong - Grilled pork with sate : 10,000Vnd for three sticks. Because I live In Hanoi, where pho comes from, eating noodles in Saigon is always an interesting experience. In Saigon nowadays, there are so many modern noodle shops which are nothing special but way out expensive, such as Pho 5 Sao , Pho 24 and Pho 2000. It's better to go to normal noodle soup stalls on the street or in the market where the atmosphere is from the past and the noodles are cheap. Real Vietnamese food is always found on the street even though it is sometimes not very comfortable to sit down on a low chair. 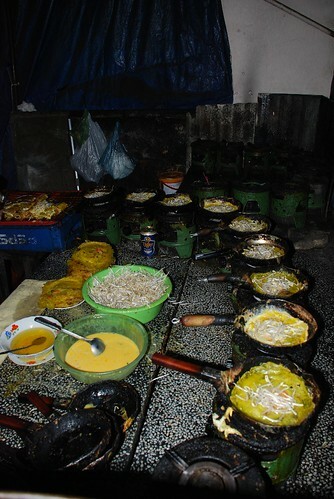 But you can clearly see how the sellers prepare your bowl of noodles. 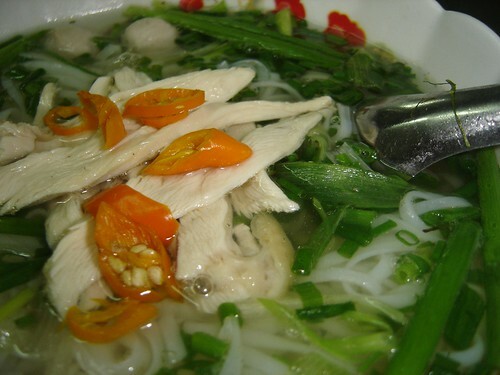 My breakfast of noodles was 5000Vnd noodle on the street near my hotel in Bui Vien street. It was super and the owner is a friendly lady who charges the same price for everyone, regardless of where the come from, foreigner or local. 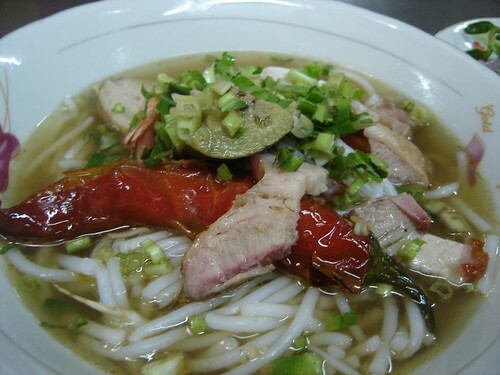 If you want to try some other noodle soup, then go to Ben Thanh market where all types of great southern food is sold. It may a little bit expensive than on the street but there's no doubt about the quality. I always go to the Ben Thanh market whenever I am in Saigon. 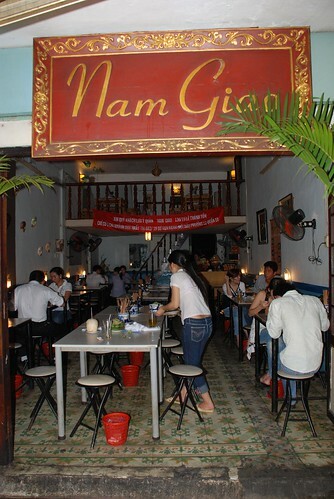 Going to Saigon to eat Hue food is a bit weird for but I love Hue food and Nam Giao Restaurant is my favorite place to eat traditional Hue cuisine. I took my mother and my nephew there. 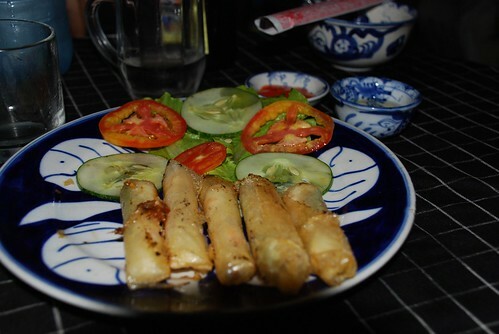 We ordered quite a few different dishes which in the end added up to only 135,000Vnd, such a cheap place. 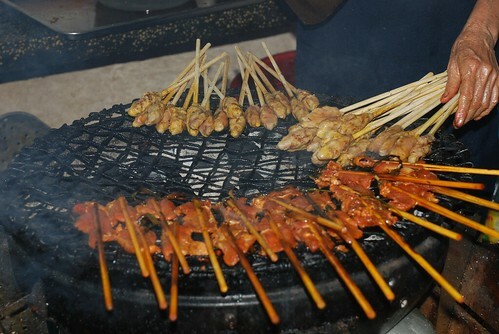 The restaurant is located in a small alley which is really busy especially both at lunch and dinner. 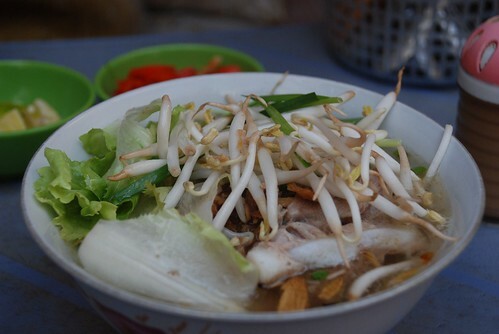 The soups like bun bo Hue and cakes like banh khoai are amongst the most popular. 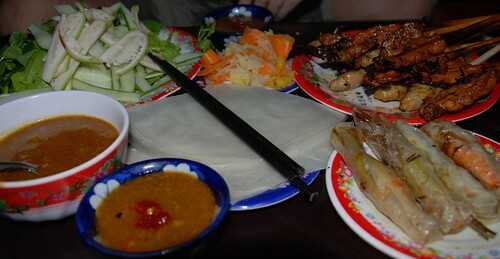 If you're in Ho Chi Minh, it's worth stopping here for a cheap meal. Shopping in KL is great and cheaper in some areas compared to Hanoi. I love shopping in shopping centres and in local markets because I can see the difference in the prices and the quality as well. 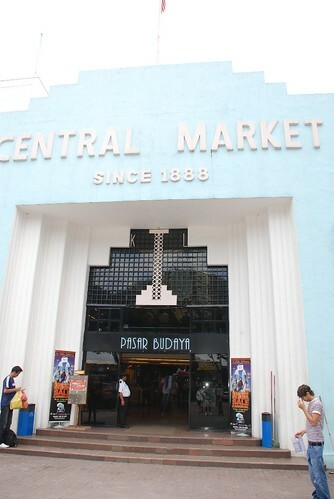 I went to one of the local markets called Central Market and actually loved it. 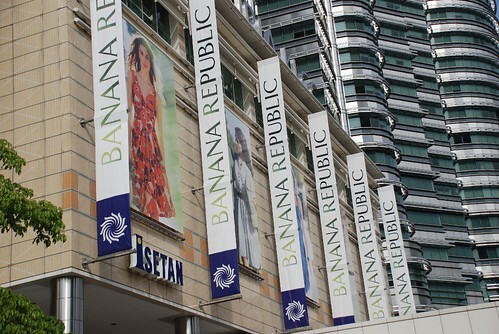 I feel shopping here is very easy and I can play bargaining games as well :). I was really lucky that I found a clearance shop and they sold all their things with a fantastic discount and I of course spent lots of time (and money!) there. I bought quite a few items like masks and wall hangings from them and I am very happy with the quality as well. I also stopped at an Indian shop called Little Kashmir which sells stuff made in Kashmir and other parts of India. This is a great shop with all beautiful hand-made stuff reasonably priced. I feel regret now because I should have bought another wall hanging or another blanket. Their stuff is carefully made with so much detail. Check this shop out if you have a chance. Shopping centers in KL look like other shopping centers around the world but they are all located in huge tall buildings. The difference is that they have a variety of stuff at great prices and the salespeople are really friendly. Clothes and cosmetics are cheaper and better quality than some other countries and I've also seen many Vietnamese in those shopping centers. I talked to some of them and they also feel a bit cold walking around these places, with the airconditioning turned down really low? 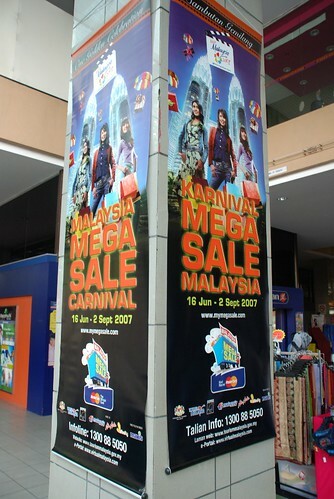 Shopping in Malaysia is a very pleasant and cheap experience.